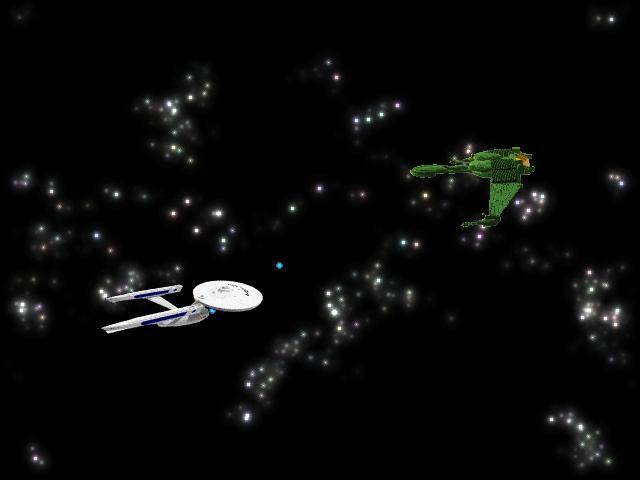 See Starfleets Enterprise maneuvre against upto three Klingon Birds of Prey. You can set your desktop to shine through the background. - Background: you can choose either a black background or a darkened version of your desktop. On top of this you can choose between a static background with some star clusters or a background with moving stars. - Speed: the actual speed will also be influenced by other settings, like the moving/static background. - Damage: on request, the ships now actually can be hit and suffer damage. If you switch this on you'll be able to see small explosions and the ships will actually look a bit damaged. There is also a statusbar indicating the condition of the ship. When the damage reaches a maximum the ship is destroyed and instantly regenerated ("Scottied"). - Shield: if you switch this on the program will display a shield ellipse for each ship which will light up when a ship is hit. With shields on ships are less likely to be hit. - Opponents: you can have up to three Bird of Prey ships as opponents. - Sound: to toggle the sound of the torpedoes and explosions.